Omagoodness. 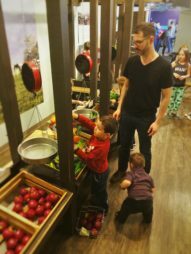 Have you ever been to a children’s museum? 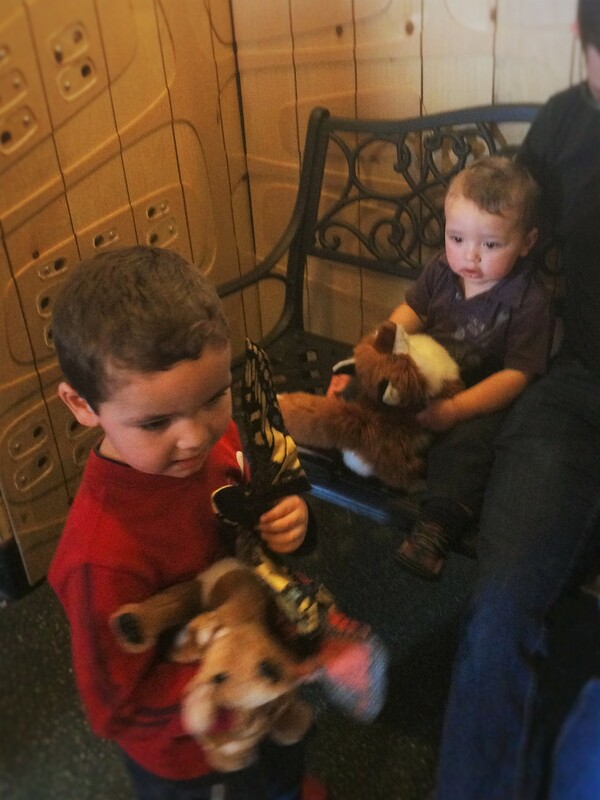 We have been to a couple children’s museums and I’ll tell you, they can be a bit stressful. The stress is all completely worth it though, or at least mostly worth it, when you see how much fun all of the kids have. 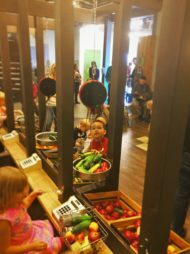 The Children’s Museum of Denver is really comprehensive as far as museums for kids go and we were glad to be welcomed by them. 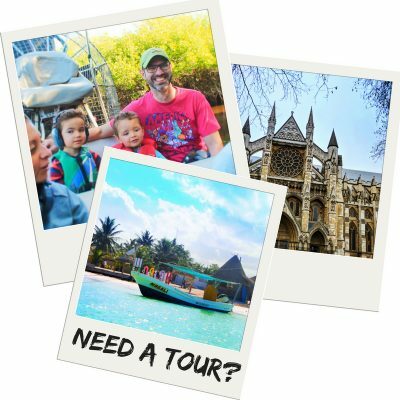 Would we normally go to a children’s museum on vacation? 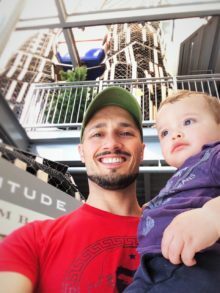 Probably not, but this was our first trip to Denver and everybody had such great things to say about the Children’s Museum of Denver that we decided to invest a little bit of time. Also, it’s right next to the Downtown Aquarium which was also on our schedule for the day. 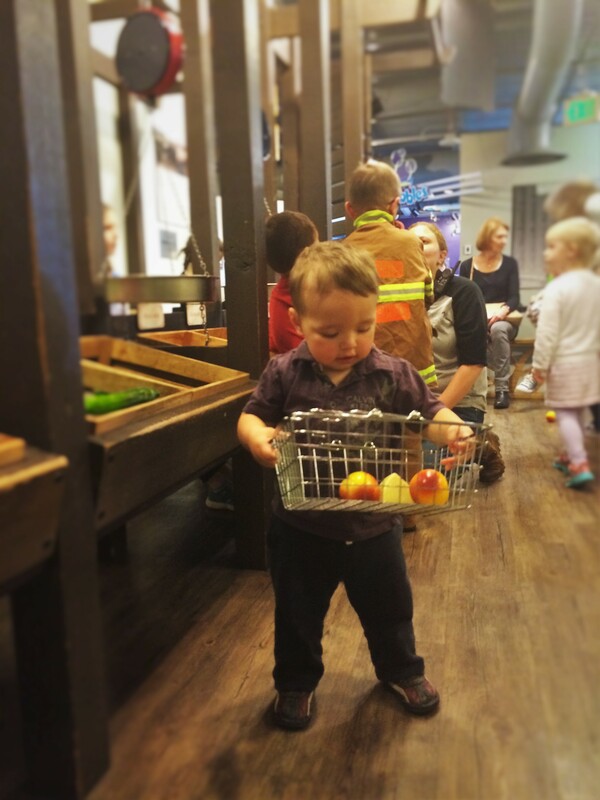 Is the Children’s Museum of Denver worth your time? If you don’t have kids, no. If you do have kids and they have lots and lots and lots and lots of energy, then totally. You need to go. 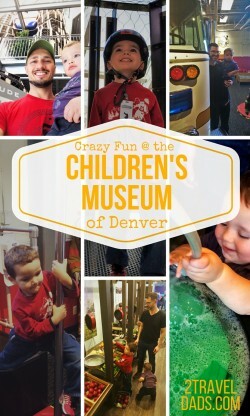 We’re going to tell you a bit about the Denver Children’s Museum as well as the tips that we’ve learned to help make a visit to such a crazy place less stressful for you, less stressful for your kids, and how to leave without having caught every type of communicable disease known to children. 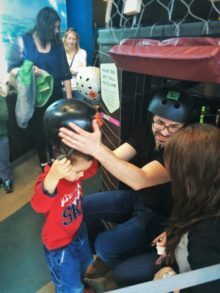 Tip: before venturing to any children’s museum, if you’ve got a sensitive soul or your child has any sort or social or learning disabilities, check if there is a low sensory day/time to make the trip better for your family. Step one to having a good day at the Children’s Museum of Denver is to have a good stiff drink. I’m kidding, you should go sober and just have happy hour plans for later because you’ll need it. Or have a massage booked for the afternoon, because that will be even better than happy hour. Anyways moving on. 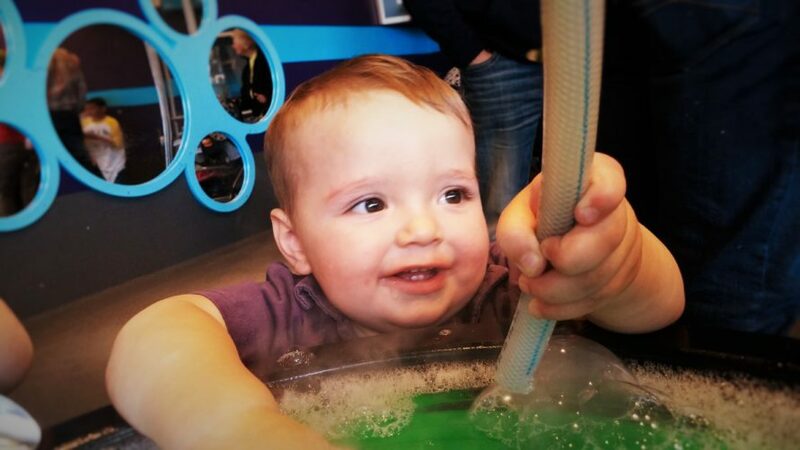 We went to the Children’s Museum of Denver on a Monday and we thought that was a great idea. Um, yeah. Always check and see if it’s spring break or something. Apparently it was spring break when we went there because it was crazy. 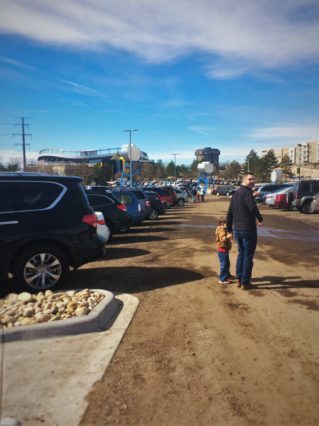 We had to park at the end of the overflow parking lot. There’s lots and lots of free parking, but if you are looking for anything close to the museum you need to get there right when it opens. Right next to the parking lot is a playground. We didn’t know that there would be a playground tempting the kids before they even got to the museum. We went ahead and took the relaxed approach, or at least I had to relax myself, and let the kids play. 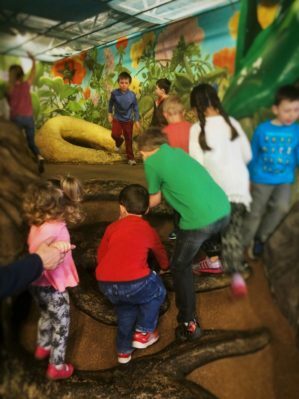 Five minutes of doing slides and climbing on things took the energy level from calm to wild before going into a confined space. Awesome. 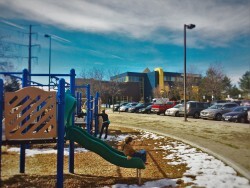 Tip: It’s a actually good idea to allow the kids to play for a couple minutes on the playground before you go into the museum, as there’s no greater torture for a child then to see slides and swings and stuff and be told that they’re not allowed to play on them because they’re heading to someplace more fun. And who wants to start their day with a temper tantrum in the parking lot? The Children’s Museum of Denver is pretty big we are only going to share with you what we thought were the best exhibits that were the most engaging for our kids. 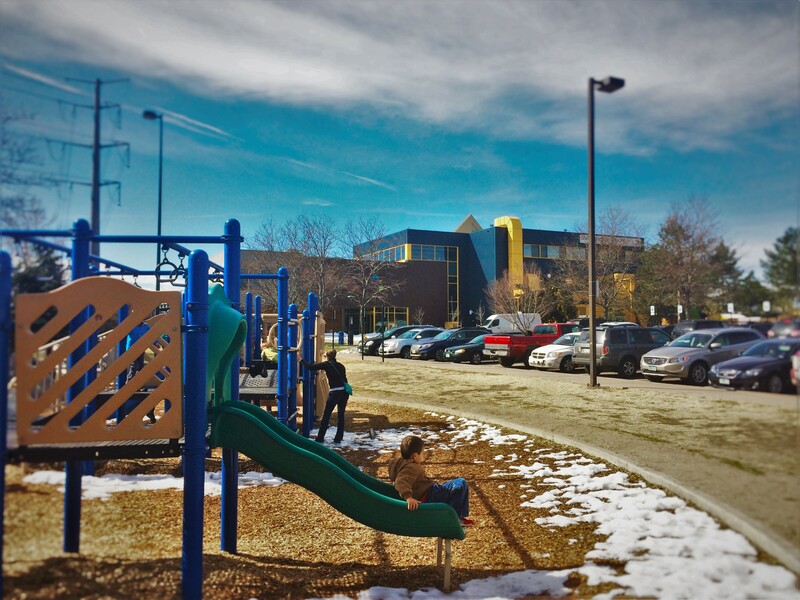 Each part of the Children’s Museum of Denver was equally cool we thought. The very first thing that you see though is called Altitude. 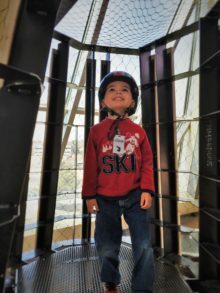 Altitude is such a cool activity because it is climbing climbing climbing climbing climbing up to the top of the museum building and really getting some… altitude. Helmets are provided for kids and adults because the climb is a real serious one. 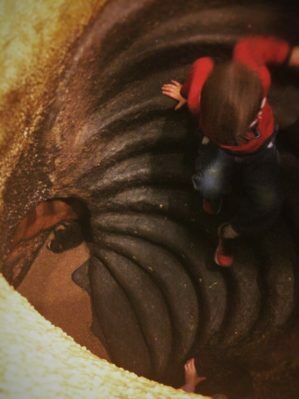 Tip: it’s fun for parents to do the climb with their kids. That way they can have a good time, keep their children safe, and take awesome pictures of their tiny adventurers. By the end of climbing altitude our little guy was super sweaty. He was also on a major energy high and ready to keep on playing and exploring. 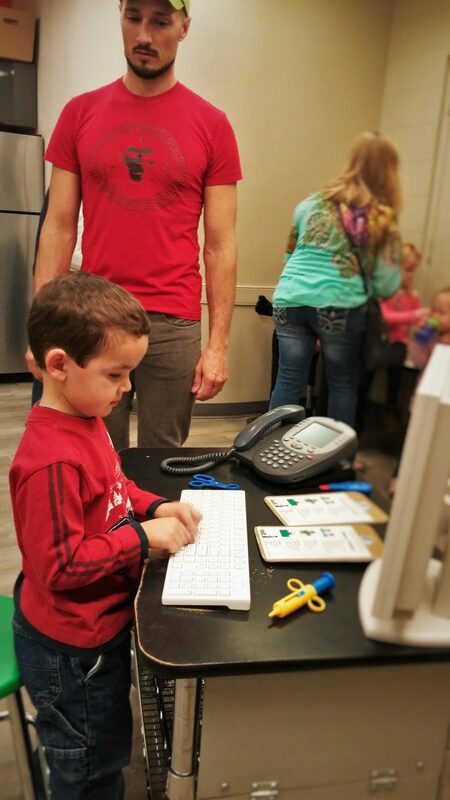 Ever go to a children’s activity and get jealous that it’s not meant for you? That’s how I felt at the fire station. 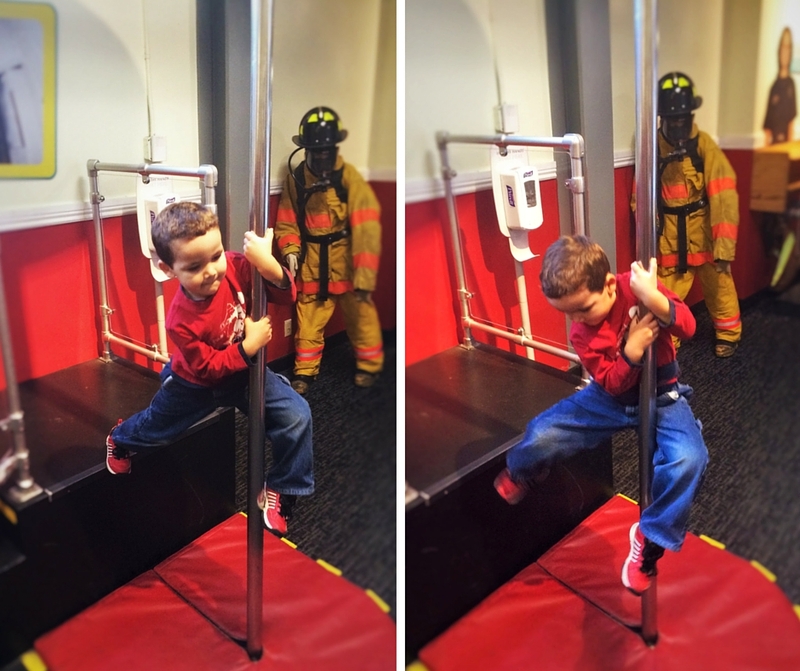 From full-on Fireman outfits to an actual fire truck, it’s pretty darn cool. There was even a stuffed dalmatian waiting for us up on the fire truck. 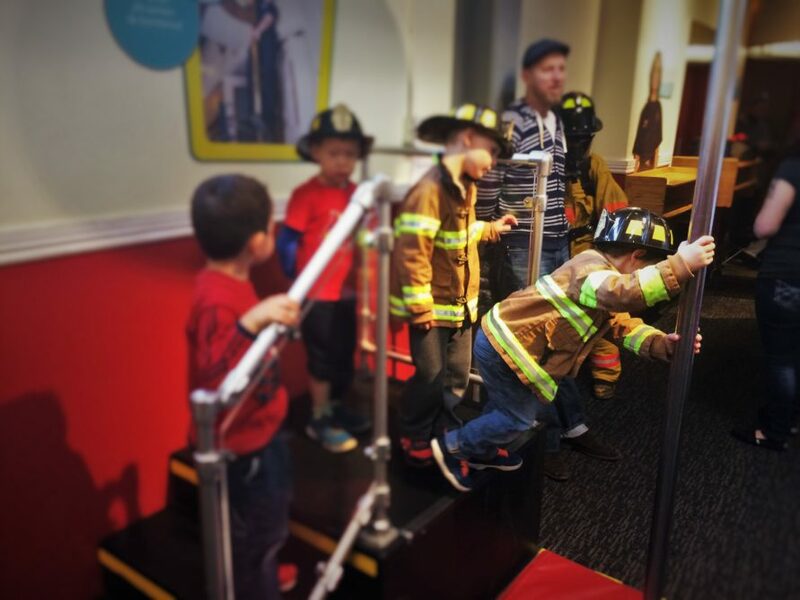 It was a little bit wild though (because what isn’t wild inside the Children’s Museum) and there were a ton of kids running around in fireman outfits with reckless abandon. Overall, it was really cute and kids dressed up and pretending to be firemen is one of the most adorable things you’ll ever see. 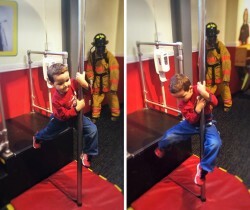 I think the funniest thing was actually watching them in fireman outfits getting in line and then going down the fire pole. Tip: Don’t be that parent that the other parents are scowling at. If you’re on your phone be sure that you’re on your phone taking a picture of your kid. Pay attention to them and be active and participate in whatever it is they are doing. 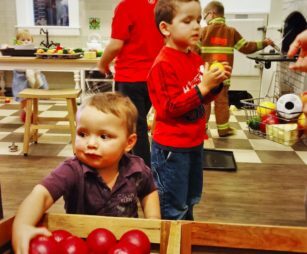 You will have more fun, your child will enjoy it more, and other parents will have a much happier day knowing that they aren’t the only ones paying attention. Ahh, the market. This is every OCD parent’s worst nightmare, but the kids love it. I will say that watching your 1 year old and your 4 year old go grocery shopping together for onions, corn and milk was adorable and was foreshadowing of them being teenagers and doing a grocery store run for us. This is one of those areas that you have to just chill out and watch your kids have fun. You can’t think about all of the germs that are covering every single fake peach or Serrano pepper. 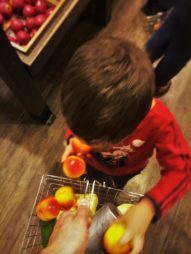 Let the kids put their groceries in their basket, check out at the cash register, and barter with each other for different fake fruit. Gosh, being a parent is weird. 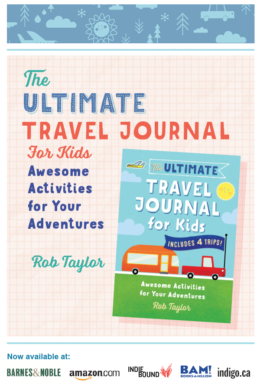 Tip: this is a great opportunity to let your kids interact and play with other kids they’ve never met. It’s so cool to see how they act like tiny adults and mimic what they see us do at the store. So this was personally my favorite part of the Children’s Museum of Denver. 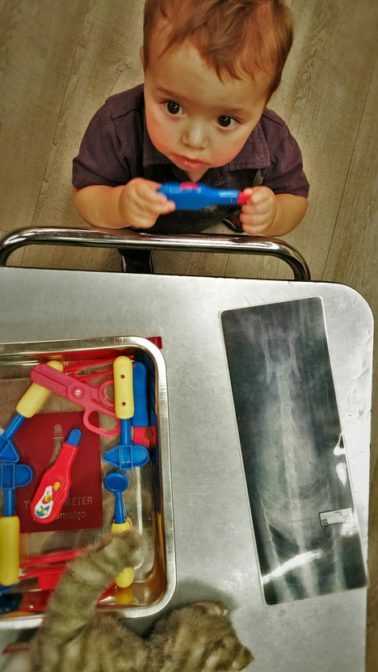 We’ve gotten to watch our oldest grow up and have fun pretending and doing fun things with weird toys, but we’ve been kind of limited in that with our one year old. 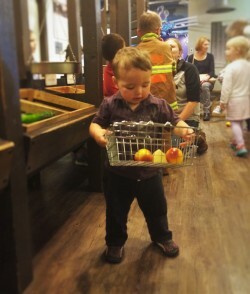 He’s only just showed interest in being imaginative or playing with pots and pans in our pretend kitchen at home. 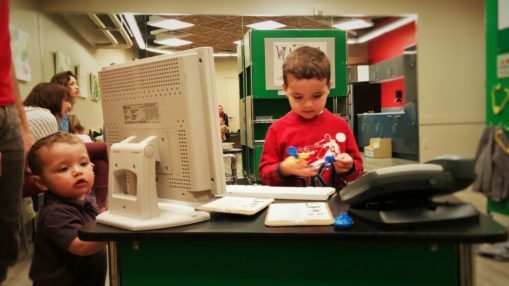 So, take that same little boy and put him in an imaginary veterinary clinic… It’s amazing. He was quite quick to pick up the kitty that he wanted to work on, he got the tools he thought he needed, and then he proceeded to give a full physical exam to the cat. He had me listen to the cat’s heart just like the doctor does when we take HIM to the doctor. Really, it was one of the first times that I’ve noticed how much older our youngest all of the sudden is (and here I go with the single tear running down my cheek). 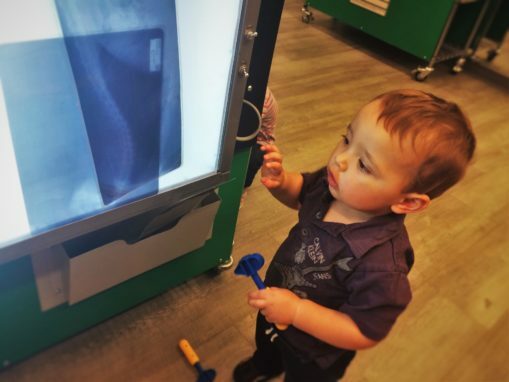 Tip: For the older kids, take a moment and explain the X-ray portion of the vet center to them. Our kids haven’t had to have x-rays yet so have never seen them except in alphabet books. This exhibit has animal x-rays that they can put on a light board and look at. It’s pretty cool and a great learning opportunity to explain what a vet visit can be like. 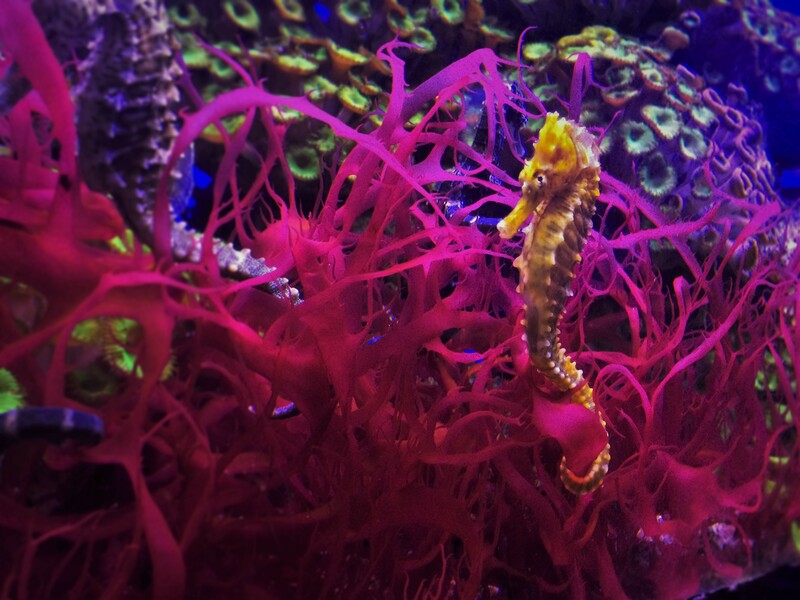 This exhibit gets another “omagoodness”. Picture it: bubbles coming up from the floor, bubbles coming down from the ceiling, bubbles on tables… Seriously, bubbles everywhere. 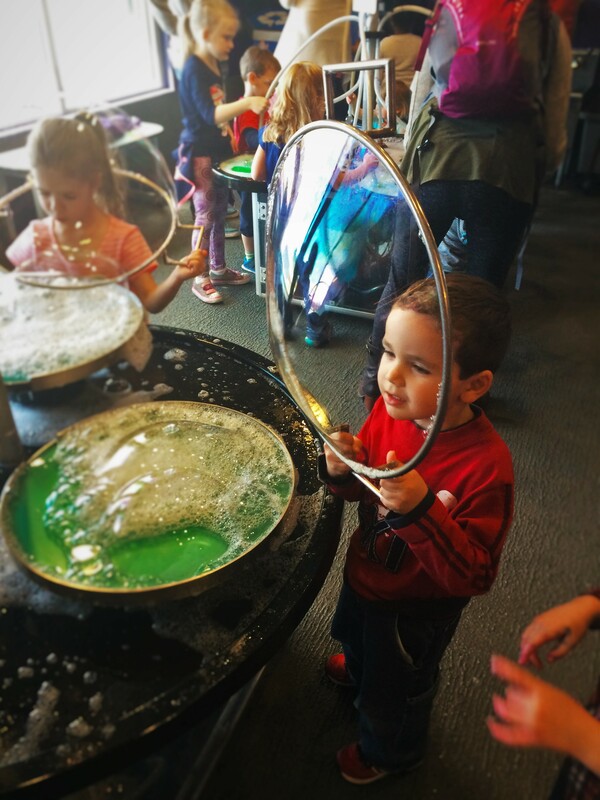 The Children’s Museum of Denver does have the foresight enough to provide clear glasses for anybody who would like to use them, but what’s the point? There’s just bubbles everywhere popping all around you and it’s just fun and you’ll still get a bit bubbly. For the older kids the bubble cage was pretty awesome. They could stand on a platform and pull a rope to lift a giant bubble wand around them and put them inside of a bubble cage. Really cool. I wish we had one at home. Actually, maybe I don’t. The hit for the younger kids, or at least for our tiniest, was the table with the air pipes. 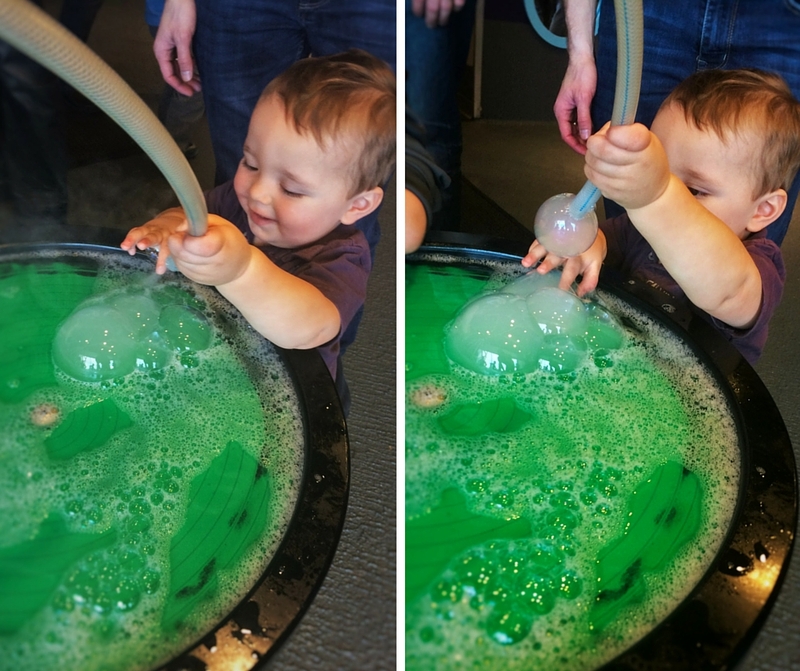 The table was covered in bubble solution with a variety of hoses coming out of it and even the tiniest visitor is able to move the hoses around and create bubbles on the table top. It’s really quite brilliant and absolutely enthralled our 1 year old. My favorite bubble feature for the bubble that fell from the ceiling. 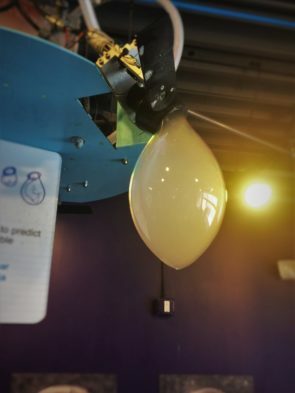 There was a contraption that would slowly fill enormous bubbles and you could try to catch them and pop them. It was a hit, as well as a bone of contention for lots of little kids. Did you know that it’s possible to claim a bubble as your own before it pops? It’s true. Tip: Again, be involved with your kid in this area. You will have fun and you’ll be able to help manage any attitude problems that start to arise and burst… just like the bubbles bursting all over the room. Fun Fact: the bubble tables and bubble drop run off of vapor. Vapor? Yep, just vaporized water, kind of like cold steam (our RC Thomas the Tank Engine has cold steam too). 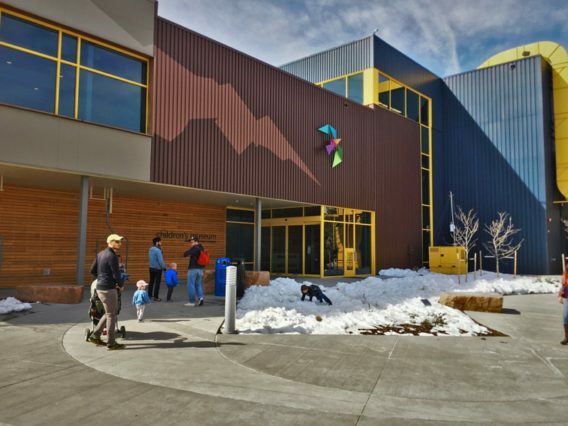 Do you see why the Children’s Museum of Denver could potentially scare anybody? Thank goodness they have bathrooms and hand washing sinks strategically placed throughout the entire museum. There is also hand sanitizer, which you definitely will want to use continually. Tip: If you have a favorite hand sanitizer product bring it with you and use it during your time there. 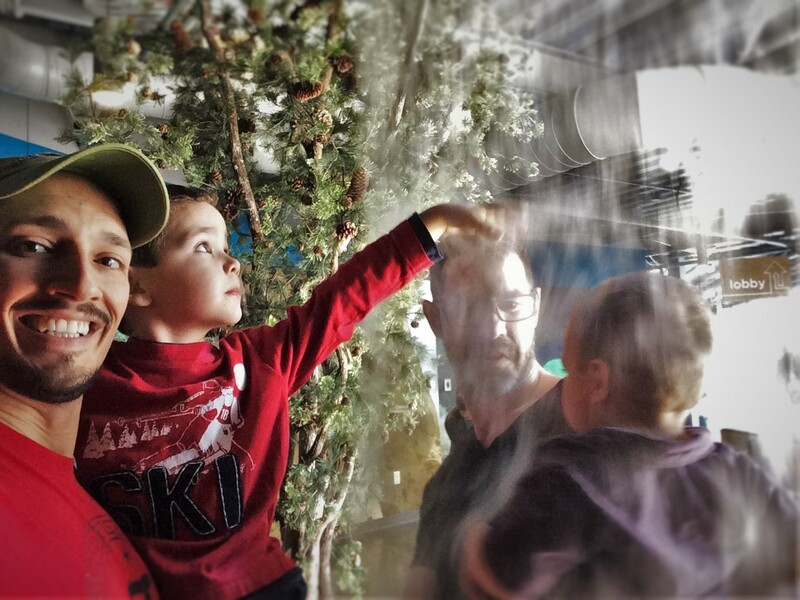 Also, feel free to bring wipes with you and wipe down your children’s hands and faces between exhibits. This might just be me being touchy, but anything to minimize the chance of getting sick, especially while traveling. 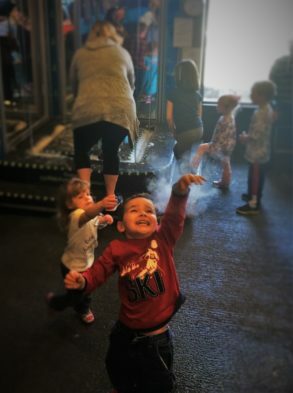 I know, overall I sound like I didn’t have fun because I’m talking about parents not paying attention and kids getting sick and all of that stuff, but really the Children’s Museum of Denver is an incredible outing to take your kids on. It’s one of those times when as a parent you get to put your own worries and stresses aside to let your kids just have crazy, wild fun with lots of other kids. 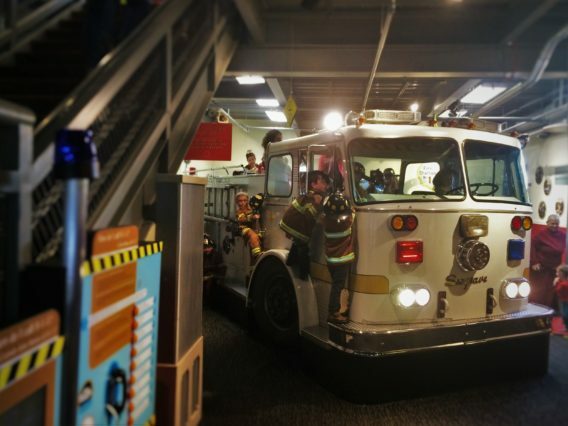 Do you have a favorite Children’s Museum? 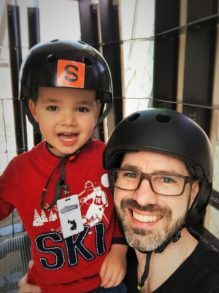 We live close to KiDiMu on Bainbridge Island and it’s a pretty fun one. Also, the Seattle Children’s Museum at the Seattle Center is a neat one that is easy to add on to a day of sightseeing in downtown Seattle. 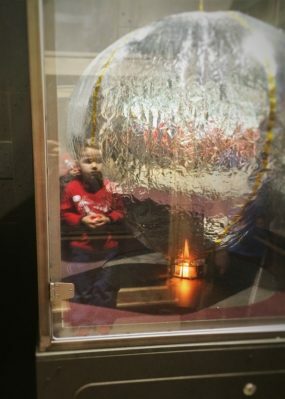 If you have a recommendation of another Children’s Museum or if you have more tips to make a visit to any children’s museum more enjoyable please leave it in the comments below. 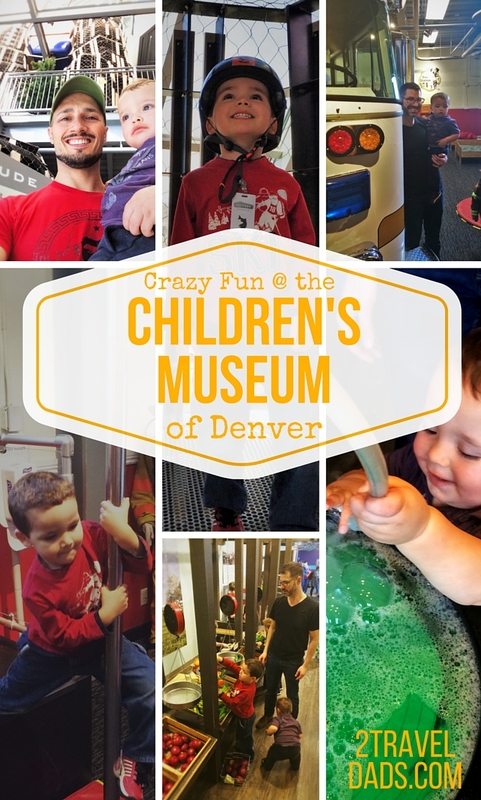 We were very glad to have the Children’s Museum of Denver welcome us and let our kids have such an amazing time and we will probably stop in again next time that we are in Denver. 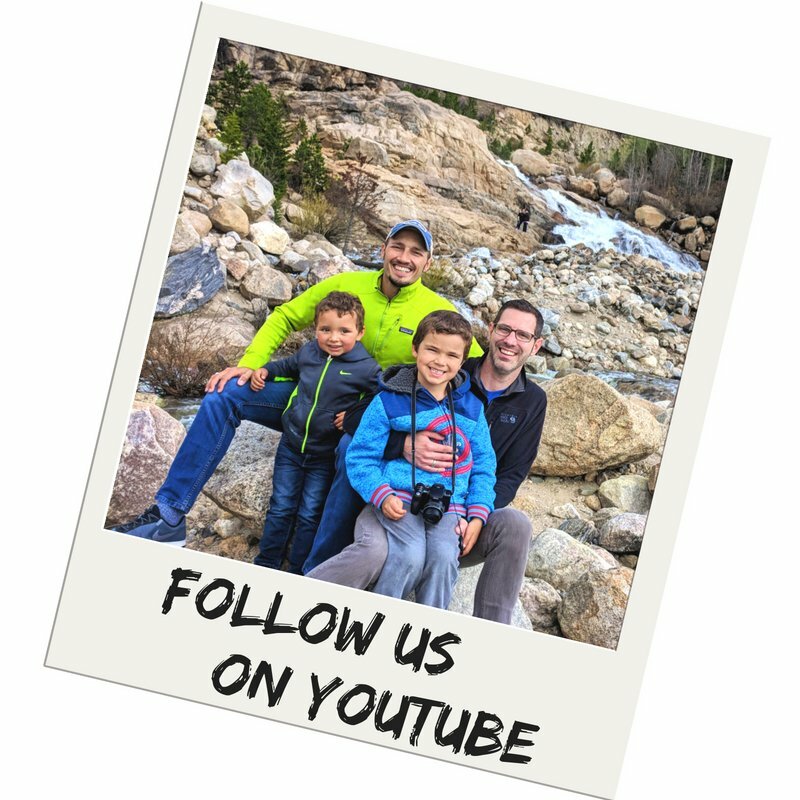 Check out other fun things we did while we were in Denver too. 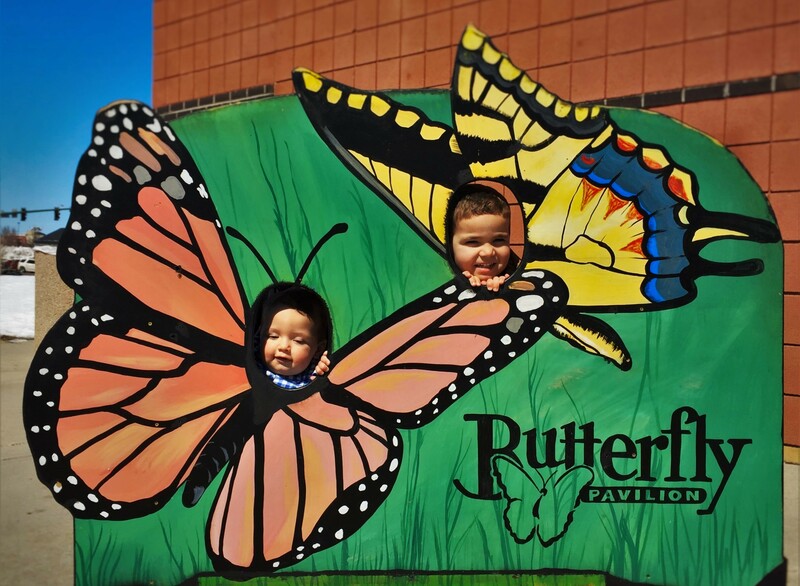 The other must-do activities for family travel in Denver are the Denver Museum of Nature and Science and the Butterfly Pavilion. We love taking our boys to children’s museums. This one looks great! We will need to plan a visit. This looks like so much fun! 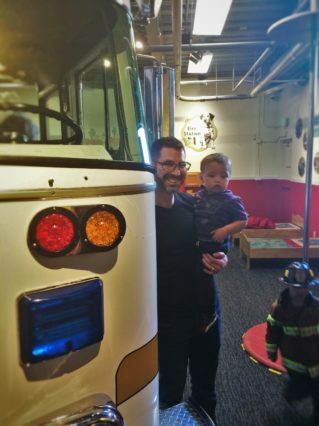 We always hit the local Children’s Museum when we travel. You usually can’t beat it for a day of kid fun! 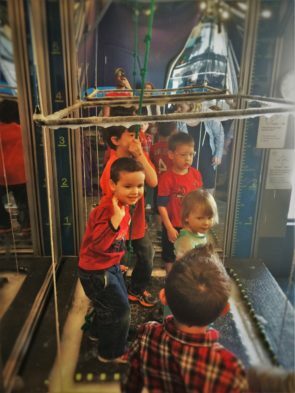 Great family fun, can see the kiddos having a great time. Ooh, I love the bubble cage. Would so become a kid for that day, just to do that. Sounds likes such a fun place for everyone. 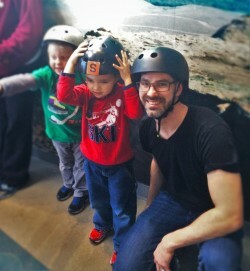 Children’s museums are an hilarious contrast in enjoyment. 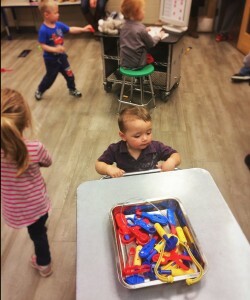 On one side, the kids have a blast, everything is tactile and fun, on the other hand, if the ratio is any worse than 1 parent per kid. Someone is getting lost!